41.9cm (16.5'') in height, 29.2cm (11.5'') in width, (built into wall). 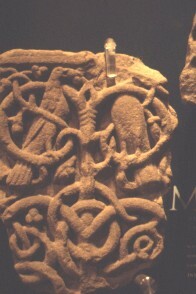 This fragment shows a scroll inhabited by two birds. The plant-scroll is a tree-scroll. The birds perch on the uppermost volutes. The one on the left is shown in profile with its beak open to peck at the fruit. The bird on the right is nearly frontal, its head is missing.